Cardiomyopathy is disease in which the heart muscle becomes weakened, stretched, or has another structural problem. Dilated cardiomyopathy is a condition in which the heart muscle becomes weakened and enlarged. As a result, the heart cannot pump enough blood to the rest of the body. There are many types of cardiomyopathy. 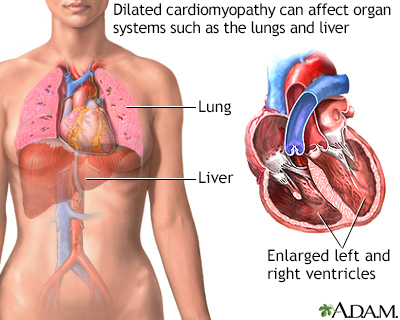 Dilated cardiomyopathy is the most common form. During the last month of pregnancy, or within 5 months after the baby is born. Symptoms of heart failure are most common. They most often develop slowly over time. However, sometimes symptoms start very suddenly and may be severe. Lung crackles (a sign of fluid buildup), heart murmur, or other abnormal sounds. The liver is possibly enlarged. Heart biopsy, in which a small piece of heart muscle is removed, may be needed depending on the cause. However, this is rarely done. Know your body, and watch for symptoms that your heart failure is getting worse. Watch for changes in your symptoms, heart rate, pulse, blood pressure, and weight. Limit how much you drink and how much salt (sodium) you get in your diet. Most people who have heart failure need to take medicines. Some medicines treat your symptoms. Others may help prevent your heart failure from becoming worse, or may prevent other heart problems. A heart transplant may be recommended if standard treatments have not worked and heart failure symptoms are very severe. Placement of a ventricular assist device or artificial heart may be considered. Chronic heart failure becomes worse over time. Many people who have heart failure will die from the condition. Thinking about the type of care you may want at the end of life and discussing these issues with loved ones and your health care provider is important. Heart failure is most often a chronic illness, which may get worse over time. Some people develop severe heart failure, in which medicines, other treatments, and surgery no longer help. Many people are at risk for deadly heart rhythms, and may need medicines or a defibrillator. Call your provider if you have symptoms of cardiomyopathy. Get emergency medical help right away if you have chest pain, palpitations or fainting. Falk RH, Hershberger RE. The dilated, restrictive, and infiltrative cardiomyopathies. In: Zipes DP, Libby P, Bonow RO, Mann DL, Tomaselli GF, Braunwald E, eds. Braunwald's Heart Disease: A Textbook of Cardiovascular Medicine. 11th ed. Philadelphia, PA: Elsevier; 2019:chap 77.